X-45 - Glidecam Industries, Inc. 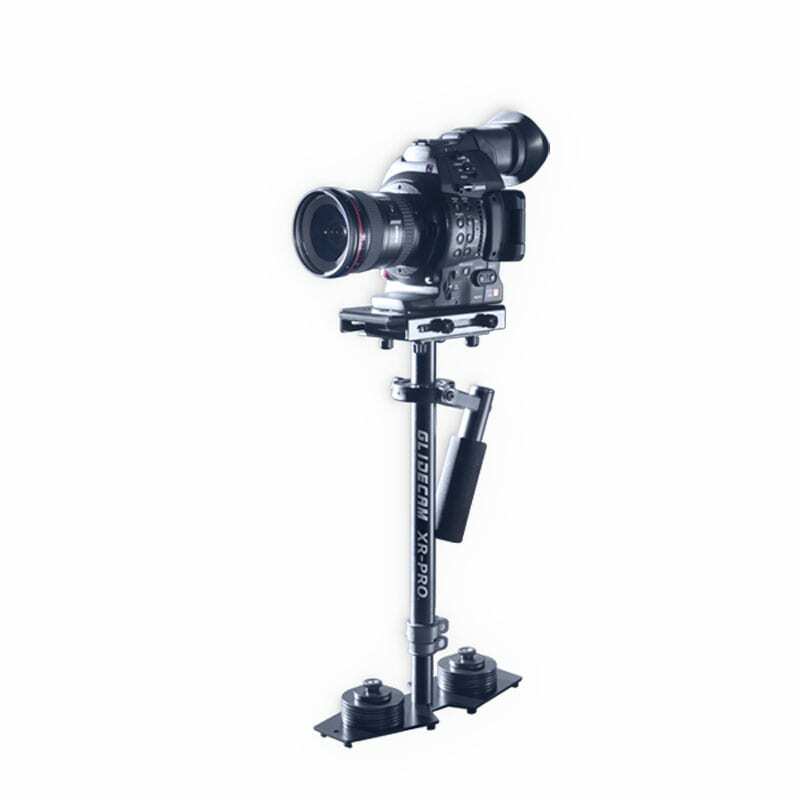 The GLIDECAM X-45 is a highly advanced, professional camera stabilization system designed for film and video cameras weighing from 25 to 45 pounds. The GLIDECAM X-45 System incorporates advanced engineering and precision machining, making it the most sophisticated and versatile system in its price range. The GLIDECAM X-45 system will allow you to walk, run, go up and down stairs, shoot from moving vehicles and travel over uneven terrain without any camera instability or shake. The complete X-45 system is comprised of a Support Arm, a Support Vest and a Support Sled. The GLIDECAM X-45 system works by isolating your body’s motion from your camera, while your camera is balanced in a relatively motionless and isolated state. The GLIDECAM X-45’s Support Arm can be boomed up and down, as well as pivoted in and out, and side-to-side. It is the combined low friction booming and pivoting action of the Support Arm that isolates your body’s motions from the camera enabling you to create super smooth moving camera footage. 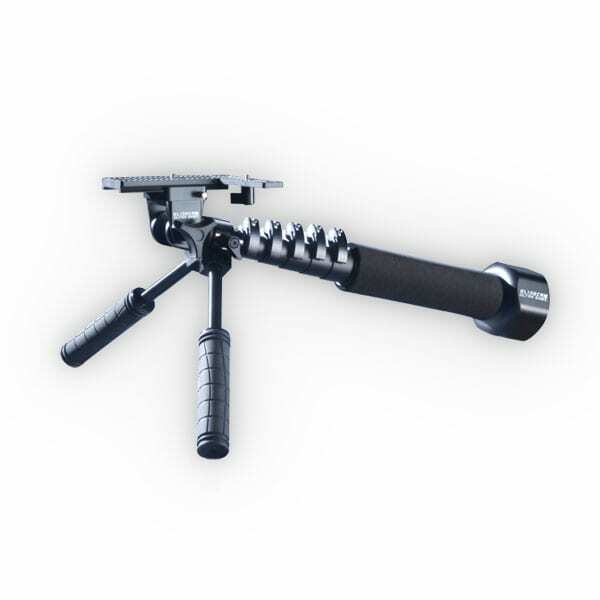 The GLIDECAM X-45 is a highly developed and meticulously engineered camera stabilization system. Its ability to shoot smooth imagery within its weight range is extraordinary. It out performs all of the competition in its class, yet remains truly economical. With the GLIDECAM X-45 you will be able to acquire the type of smooth footage often required in today’s competitive production environment. 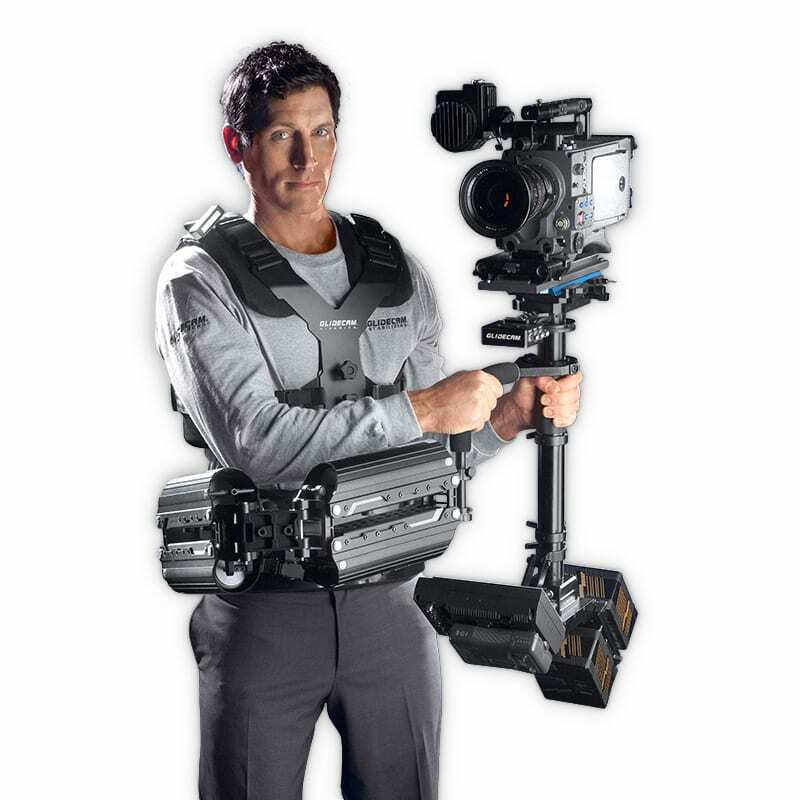 The GLIDECAM X-45 System includes: Glidecam X-45 Support Arm, Glidecam Support Vest, Glidecam X-45 Support Sled, Docking Bracket, Arm Post, Hardware and Operations Manual. The GLIDECAM X-45’s Dyna-Elastic™ Dual-Articulating Support Arm incorporates 18 precision radial bearings within its machined T6 aluminum structure. The placement and implementation of these double-shielded bearings produce minimal friction and allow the X-45 Support Arm to pivot and boom smoothly, and with virtually no noise. Four Titanium Extension Springs are employed within the Support Arm’s hardcoat anodized Exo-Skeletal Shells. Utilizing Class Three Levers, the energy of the Extension Springs acts upon internal Fulcrum Points, and provides the Support Arm with its lifting power. The spring tension is field adjustable and allows for varying camera weights. The X-45 Support Arm can hold a total combined Camera and Sled weight up to 70 pounds. 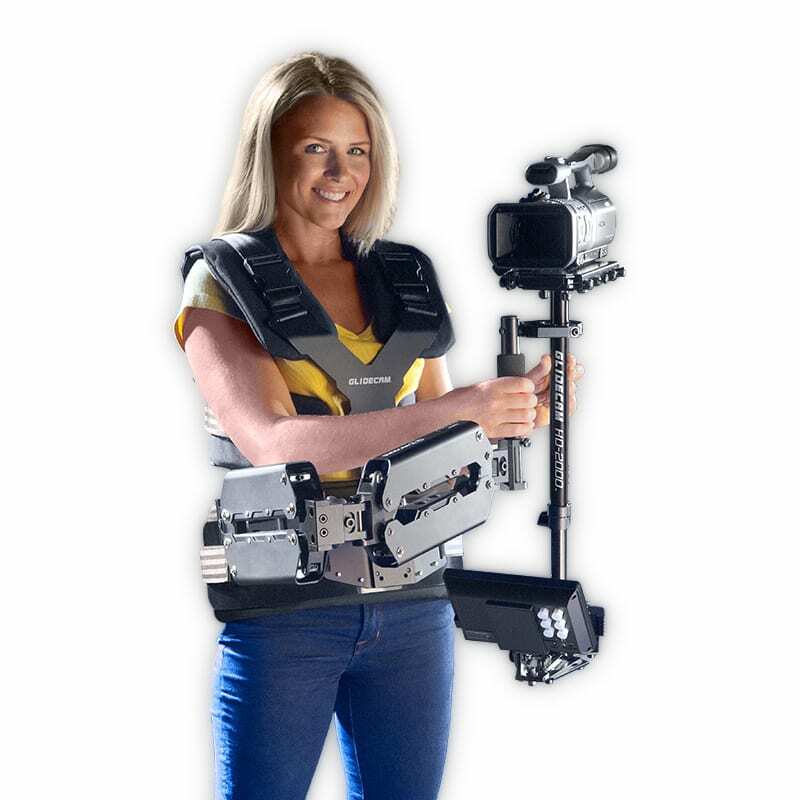 The Glidecam X-45 Support Vest is lightweight, comfortable and can be adjusted to fit a wide range of operators. High endurance, dual density, EVA foam padding and integral T6 aluminum alloy create a vest which can hold and evenly distribute the weight of the system across the operator’s shoulders, back, and hips. For safety, quick release, high impact buckles allow the vest to be removed quickly. The Vest’s outer shell is made of 1000 denier cordura fabric, and 7-panel seat belt strapping, noted as being the best in the industry. The GLIDECAM X-45™ Sled is designed to hold film and video cameras weighing from 25 to 45 pounds. The X-45 Sled incorporates sophisticated engineering and precision machining, making it both lightweight and strong. The GLIDECAM X-45™ Sled is comprised of four major components. These are the Camera Balance Platform, the Three-Axis Gimbal, the Dynamic Base Platform and the Telescoping Center Post. Dual Support Arm Weight: 11 pounds 4 ounces in Two Spring Mode, without arm posts. No-tools adjustable Support Vest, with break-away safety system. Quick pressure release dual buckle design Support Vest, with positive locking buckles and fast ratcheting adjuster buckles. 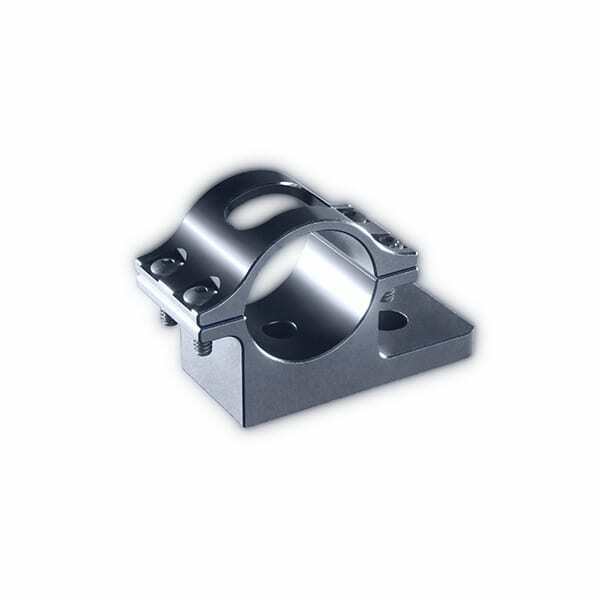 Industry standard arm connector made of Titanium for added strength and durability. X-30 Support Arm Weight: 11.4 lbs. No-tools adjust, break-away safety system. Quick pressure release dual buckle design with positive locking buckles and fast ratcheting adjuster buckles.